Finally! A Gedmatch Admixture Guide! Update: I think perhaps I was not clear enough when originally writing this that ethnicity/admixture is only an estimate or interpretation of your DNA, it is NOT an exact science and different interpretations often yield wildly different results. It's usually accurate on a continental level, but sub-continental regions generally share too much DNA to always be able to reliably tell them apart. That is why most of Gedmatch's calculators often cover broad areas. The more specific an area is narrowed down too, the more speculative the results are. Plus, different sample groups and different algorithms will always produce different results and there is no one option that is always going to be more reliable than any other. While the ethnicity reports can be fun and interesting to explore, which is why I wrote this guide, they really should not be taken literally. You should not attempt to use them to definitively prove your ethnic origins (on a sub-continental level), or exact amounts of any given ethnic origin, or a specific geographic path your ancestors might have taken over time, or especially to confirm a specific ancestor's identity. If that is what you're looking to do (particularly the latter), you are better off working with you DNA matches (if you have not opted into matching, you should seriously consider it, since that is where the true value of the test lies). Additionally, be aware that Gedmatch's admixture calculators haven't been updated in years (though all of this still applies to other companies who have provided updates more recently). With all that in mind, I hope this guide is useful to helping people understand the different interpretations of their DNA available on Gedmatch. Have fun, but remember, don't take it too seriously. For those unaware, Gedmatch.com is a website where you can upload your raw DNA data for further analysis and matching with people from other companies who have also upload their data. 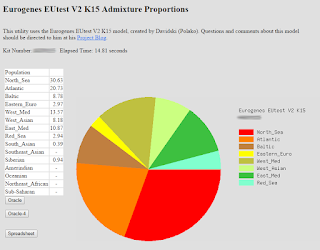 Parts 3 and 4 on Admixture Proportions by Chromosome and Chromosome Painting now available. Part 5 on Spreadsheets is now available. Despite all the help articles available on Gedmatch.com, none of them really offer a comprehensive guide to understanding the admixture calculators for newbies. Most of them are guides on understanding DNA in general, or how to upload your data, or using the one-to-many or one-to-one tools. In fact, there is a very good beginners guide to the matching side of things found here. But the most common questions I see about Gedmatch are “which admixture calculator do I use?” and “what do the results mean?” There is a Gedmatch wiki page on admixture, and there is Kitty Cooper's slide presentation, but I don’t think they really answer all the questions most people are looking for, especially regarding Oracle. Even Googling the topic only turns up spotty results from forums and blogs, nothing that really lays it all out. Since no one else has done it, here is my attempt. Please keep in mind I am no expert and have no formal education in genetics, this is just the knowledge I’ve gathered over the years from various sources as a result of trying to understand my own DNA results. Be aware that it’s common practice in DNA admixtures to refer to populations from prehistoric times as “ancient”, even though this is a bit of a misnomer. In historical terms, ancient history marks the beginning of recorded history, but here, “ancient” generally refers to the time before written history, prehistory. Some time periods might be specified as “neolithic”, or “paleo/paleolithic” etc. options as they are, then click "continue"
number and then select a specific calculator. You’ll find that for each project, there are often several calculators to choose from. How to choose? What do they mean? What are the differences? Well, for starters, the numbers following a ‘K’ indicate how many populations (or regions/categories) that calculator includes. So for example, Eurogenes EUtest V2 K15 has 15 populations. So choose one depending on how many regions you want to break your results down into. Keep in mind the more populations and therefore the more specific the regions are, the more speculative the results will be. Don't forget to put in your kit number - if you've forgotten it, go back to the home page and copy it. Certain other tests may be specific to deeper, more ancient (prehistoric) ancestry, like Hunter-Gatherer vs Farmer. Any abbreviation that starts with ‘A’ probably stands for ‘ancient’, but I will post a comprehensive terminology list at the end of this guide. These calculators for ancient DNA aren’t very useful if you’re just looking for an opinion on your more recent ethnicity results. Here’s a more detailed breakdown of each calculator. I've also created a spreadsheet listing the populations included for each calculator, along with my recommendations for good calculators to use based on your ancestry or what you're looking for. HarappaWorld only has one calculator and as explained above, it’s primarily for South Asian ancestry. It does include some European, African, and Native American populations, but its focus is on South Asian: Indians, Pakistanis, Bangladeshis and Sri Lankans. Ancient Eurasia K6 - 6 ancient populations, primarily Europe, Asia, and in between, 1 African, no Native American. Further descriptions are available on results page. (Removed) Near East Neolithic K13 - 13 ancient populations, with a focus on the Near East. Details provided on results page. Which project and calculator you go with greatly depends on your known ancestry. I know all this info is probably still a little overwhelming even with (or perhaps because of!) this guide. If you’re of European descent, and a newcomer to Gedmatch, and you just want a second opinion on your ethnicity results from any of the Big 3 companies (Big 4 now maybe, with MyHeritage joining the bandwagon), I’d recommend Eurogenes K13 or K15. Personally, I tend to prefer K15, because there are maps available showing specifically what regions are covered by which populations. Certainly, you can play around with any of the other Eurogenes calculators too (except Jtest if you’re not Jewish). Most of the other projects and calculators are either geared more towards ancient DNA, other continents, or a mixed ancestry. You may find a non-bias global calculator in some of the other projects, but it’s probably not going to provide the breakdown of Europe you’re looking for. If you’re African, Asian, or of mixed heritage, there are a number of options to choose from, but I unfortunately can’t recommend any over any others. Most global calculators will include Amerindian (I have noted when one doesn’t), but MDLP World22 seems to have the most categories for Native Americans and may be ideal for that. I was surprised to realize Eurogene's Jtest is the only one that offers an Ashkenazi (or other Jewish) category, so if you're Jewish, it looks like this is your only option. However, it should be noted that there are many Jewish populations typically included in Oracle/Oracle 4 (see below for more details), not just for Jtest but any other given calculator too. For your reference, I created a spreadsheet that shows which calculators have what Jewish populations available in Oracle/Oracle4. If you're adopted and don't know what your ethnic background is, is important to remember that there's never going to be one defining ethnicity or admixture report that tells you "this is your ancestry" with any total accuracy. However, I understand the desire to know where you came from, so what I'd recommend is gathering as many reports as you can (within reason - if you're obviously white, there's no sense running an African-only calculator) and compare them in a spreadsheet like I've done here. It will help you spot any consistencies, or see what populations show up most frequently in the highest numbers. The second most common questions I see about Gedmatch are about Oracle. What is it? What do the results means? Oracle is an attempt to pinpoint your origins to a more specific population or region. You'll find many are narrowed down as specifically as regions within countries, or specific religious groups. There are two options: Oracle and Oracle 4. You will find buttons for them listed under your admixture results. Note that not all admixture calculators have Oracle available so pick a calculator that both suits your background and offers Oracle. There is a third button which just says "Spreadsheet" but this is covered this later. There is a also good explanation for this from Roots & Recombinant DNA. Single Population Sharing attempts to pinpoint a specific, single population that your DNA most closely matches, with a list of the top 20. The distance will tell you how closely you match each group, so the smaller the distance number is, the more closely you match. It is assuming your ancestors all came from the same area/population (so if they didn't, this is probably not ideal for you and the results may not make sense). Mixed Mode Population Sharing will show you your top 20 of two specific, combined populations in order of how closely you match those populations. It is assuming your ancestors came from only two locations/populations (though not necessarily split 50/50). Again, the distance will tell you how closely you match this combo of populations, while the percentage will tell you how much of your DNA matched which population. Oracle 4 is essentially the same as Oracle, except it expands on it by providing combinations of 3 and 4 specific populations. The single and double combinations can be different from original Oracle though, so don’t bypass Oracle thinking you’ll get that and more with Oracle 4, it may be best to examine both depending on your ancestry. Using 1 population approximation works the same as Single Population Sharing in Oracle, but I’ve noticed the results are sometimes different, so they’re obviously using a slightly different calculation. Reading the results works the same though: they are showing you a list of specific populations you most closely match, with the distant showing you just how closely you match. Again, this is intended for people whose ancestors all come from the same population. Using 2 population approximation also works similarly to Mixed Mode Population Sharing but you'll notice that the percentages are always 50/50. That's because it's assuming that you have one parent from one population, and the other from another, so you would be 50/50. If that's not the case, this is not ideal for you. For some reason this only lists your top 1 result instead of the top 20. Again, the distance tells you how closely you matched this combo of populations. Using 3 population approximation works the same as 2, but with a combination of 3 populations instead. So it's assuming you have one parent from one population and on your other side, you have a grandparent from a different population, and the other grandparent from a third population. This is why one population will be 50%, and the other two are 25%. It only lists one result. You know what the distance means by now. Using 4 population approximation uses a combination of 4 specific populations you most closely match and lists your top 20 combos. This was designed for people who have 4 grandparents from 4 different places but it can sometimes also work well if most of your ancestry is mainly from 4 different places/populations (because it does not include percentages). Be aware that the results from Oracle and Oracle 4 will vary depending on what admixture calculator you used, which is why they are found on the admixture results page, and not as a separate calculator. Also keep in mind the results are speculative, but I have found they do often make some sense, and in some cases, can be remarkably accurate. Check out my blog post on a deeper analysis of my Oracle results here. However, if you do not fit the scenarios described of having parents or grandparents from one location, the results may not be reliable for you. A lot of ancient populations in Oracle will likely have unfamiliar names but there's a good a map showing where many of the samples for the ancient populations came from available here. If you feel like you've got a good handle on this, continue onto Parts 3 and 4, Admixture Proportions by Chromsome and Chromosome Painting. This is really useful and needed. Thank you! Great work. I have always found Gedmatch's admixture very confusing. The information you have shared has cleared it up. Thank you for your excellent article. Thank you. Lots of information to filter. However, I'm so gratefully you shared this awesome knowledge. Great. Any info on chromosome painting? I might do another guide on the other options by Admixture by chromosome and Chromosome painting if it seems like there's a demand for that. I would love that, I cannot figure out how to read the chromosome paintings at all!!! Hello, your information is quite helpful. I was wondering, if you have a key for some of the place listed as 2 letter abbreviations when you look at the Oracles? I can guess on some and others leave wondering where they are referencing. Here are some examples that I just do not known: Hu, PT, ES, RO, and IE. Thanks for your information in the blog post. That's interesting, I don't think I've ever come across two letter abbreviations in Oracle - you must match some populations I don't. Which calculator are you using when you get these results? I think I figured it out... It is European country abbreviations. Silly, I finally put the right key words into google https://mfi-assets.ecb.int/resultMfiD/abbreviations Thanks again for your information. Excellent article. Do you know what to do on the Oracle if the single population is totally different from the four population estimate? Do you pick the one with the lower number or the one that is a better fit to your known history? Also, I had several ZERO diatances. Is that good? Thank you for any help you can provide. I've been scouring the Internet. Zero distance from a population on Oracle would mean you matched that population exactly, so that's very good. I don't think there is ever a definitive answer though, since this is all very speculative data. I would take it all into consideration. I think I'm probably just really stupid. I still don't exactly know how to read the results. I have an idea, but I don't like to assume anything. For example, what exactly does your first photo, the pie chart, say? What do the spreadsheets mean? How do you read them? The pie chart is just a visual of the percentages to the left. So it's saying I got 30.63% in the region labelled North Sea (areas that border the North Sea), 20.73% in Atlantic (European areas that border the Atlantic Ocean), 13.57% in Western Mediterranean and 10.87% in Eastern Mediterranean (those are my Italian ancestry), etc. Thanks for the explanation and link! It makes much more sense now. I'm just trying to find out who I am. I know I'm American Indian but I don't know how much. Thank you so much! So helpful! I was looking at all this and not understanding. This helped so much! Thank you - that is so helpful. I'm new to this and have been utterly bewildered to date. That explains a lot. this is an amazing blog, thank you so much for making it clear and simple to understand! Your blog clarifies it much more than Gedmatch. I know I'm mixed...very much but thr closest I have come to 0 is 2.5 with the 4 population mode. Maybe I missed it, but is there a map for the Eurogenes K13 model? Unfortunately not - there are some maps for K15 though, which has some similar populations you could probably apply to K13. OMG, thank you, believe it or not you have actually made me understand! Excellent! 👏🏻👏🏻👏🏻 Thank you for putting all this into context. I'd figured out much of this over time, however this is a perfect place to come to as a reference guide. Thank you so much for taking the time to write and publish this. It has been very helpful and appreciated! These calculators are so wishy-washy. Why would you believe any of them when they tell you different things on different calculators. I also find it hilarious how one person told me that the "SSA at 1%+ was only real in Southern Europeans and that 0.x% SSA for all other Europeans was just noise and to not count it". LOL. Agenda much. Looking at the K3 averages page SSA, even at tiny percentage shows up in Norwegians as an average in the averages section of the calculator..
Something like 0.08. It's tiny but it's still there yet people insist that it's only legitimate when it comes to Southern Europeans. All the calculators are certainly estimates and no ethnicity/admixture report should be taken literally. But it is still interesting to see the different reports and how they work. I imagine the person talking about African results for Southern Europeans versus Northern Europeans was referring to the fact that many Southern European do get consistent trace amounts from Africa because that Mediterranean area is so mixed. I'm not so sure about SSA, but I have South Italian/Sicilian ancestry and I do frequently get trace amounts in North Africa and I know it's not uncommon among Italians/Mediterraneans (it's also common for Italians to get results in the Middle East/Caucasus). This person sounds like this is maybe what they were referring to, but perhaps misunderstood it slightly. 1- E Eurasian - This component peaks in E & SE populations such as Ami, Nivkh, Dai, Han, and Ulchi, at about 100%, followed by Siberian & other Asian populations such as Nganasans, Tibetans, Subba, and Mongola. 2- W Eurasian - This component peaks in Neolithic European farmers such as Stuttgart, and LBK culture, as well as in most modern European populations at over 95%. 3- SSA (Sub-Saharan African) - This component peaks in Sub-Saharan African populations such as Yoruban, Esan, and Luhiya at over 97%. It is probably not really an ideal calculator if you are of recent European descent and looking for a calculator that represents that. This is so much fun!! I've gt some literature to read now. I'm not up on Human Population Genetics. you're a life saver. time saver. great job on tackling this subject, it is very helpful! Thank you! An excellent comprehesnive guide which the website lacks! Thank you for creating this page. What a huge help in deciphering Gedmatch. Excellent! Thank you, this is very useful. I have a question though. When running Oracle you get, let's say, a distance of 4 what does that number represent: 4k years? I don't believe the distance number represents any time period, I think it's just a scale - such as from 0 to 20 with 0 being the closest, and 20 being the furthest away. That's sort of an example because I'm not sure how high the distance number goes - highest I've seen is 15.99 for mine. The lower the number, the closer you matched the samples for that population. Great Blog, my father was adopted so I only know my mums ancestry which is English and Welsh. When I run the K13 model I get single South Dutch 5.26 and mixed 91.9 south west English & 8.1 Abhkasian total distance 1.76. With K15 model I am getting single South West English 5.33 and mixed South West English 92.40 & 8.3 Tabassaran total distance 3.65. For reference my kit number is M691240. I have no idea what this information is telling me, help!!! Well, all admixture/ethnicity is fairly speculative and it's particularly difficult to determine maternal side from paternal just based on ethnicity alone. Abhkasian and Tabassaran are from the Caucasus area (above the Middle East: https://en.wikipedia.org/wiki/Caucasus ) If you're consistently seeing results in that area, there could be something to it. You are amazingly generous to spell the GEDmatch admixture out for the new, and even seasoned, DNA genealogists! Thank you. I just uploaded my sister's DNA from 23andme new V.5 to the GEDmatch's beta Genesis Admixture calculator and your guide was helpful. Extremely helpful information History Chick. I have a couple of questions. You said you preferred Eurogenes K13 or K15. K15 because of the maps. Did you mean Eurogenes EUTEST V2 K15? Also, how does one access the maps. Thank you very much. Got it! Thank you so very much. Don't know how to know if my earlier question was seen. Should perhaps have 'ticked', 'notify me. Thanks! That would be nice, but it seems they might only add guides from professional geneticists. I don't understand why K13 should be more accurate for people of European ancestry compared to the regular EUtest (not the new k15). Can you explain this ? Because it makes no sense to me. It would only make sense to me if , perhaps, the people using K13 were mostly Eastern European. That is what the creator of the project and calculators has said. Do you feel K13 is heavy weighted towards Eastern Europe? I haven't found that to be the case in my experience. It doesn't really have an Eastern Europe category to begin with - I think the regions are broader than that (I'm guessing Eastern Europe is within "Baltic" but that this covers more than just Eastern Europe - probably anything around the Baltic Sea). I don't know of any reason why K13 shouldn't be more accurate for most people - of course it depend on the individual, but I guess most people report that the particular algorithm for K13 works the best for them. Your mileage may vary, of course, but if you'd like more info on how the calculators work behind the scenes and why one might generally be more accurate than another, you would have to contact the project's creator. First, how accurate are the Admixture Calculators? What are their Specificities, Sensitivities, Positive Predictive Values, Negative Predictive Values, and Confidence Intervals? I can't find these in GEDMatch.com. I can't take any of these calculators seriously without these values. Second, what does the "GED" stand for in GEDMatch? You would probably have to contact each of the projects creators to get that kind of technical information. Or check their blogs - they might share that kind of thing on their blogs. If not, you would have to ask them. However, all ethnicity or admixture reports are only ever going to be estimates, since people of neighboring regions share some DNA, making it not always possible to tell them apart with any real accuracy. I wouldn't take any ethnicity/admixture report very literally, it's just fun and interesting to explore. How accurate they will be depends on the individual - you will likely find some are more accurate for you than others and they probably won't be the same ones for everyone. Like I say, some are designed for people of certain ancestry so if you use one that's not ideal for your ancestry, it's probably not going to be very accurate. I assume the GED in GEDmatch stands for the same thing that GED in "gedcom" stands for: Genealogical Data. All of the tests mentioned above are interesting. But in each of them, they only mention Amerindian as an afterthought, if mentioned at all. I would hope someday someone would create a genetic test that was centered upon finding small amounts of American Indian genetic information. The few tests available that do look at it do so as an afterthought, and minimize its role. Unfortunately that's probably because many Native Americans in the US are reluctant to participate in supplying samples. So working with small sample groups doesn't allow them to break it down further. The majority of the samples come from Latin America and Canada. That said, MyHeritageDNA attempts to break it down into 3 regions, and LivingDNA attempts 4. DNA Tribes has the most with 7 regions, but I honestly couldn't say how reliable they are: http://dnatribes.com/populations.php - also note how there's no category that covers the eastern US. That's because tribes in the east were largely pushed west and forced to integrate with western tribes, which creates another problem in finding full blooded tribal members that aren't a mixture of different tribes. I used My Heritage as a means to cheaply get my raw DNA results. I then went to Gedmatch , contacted Dr. Doug Mcdonald and additionally sent my raw DNA to DNA Tribes. Those results all coalesced together perfectly and showed me all the stuff MyHeritage left out. Showed my Native American, etc. My Heritage showed my NA as Eskimo only. Most of the East Coast tribes are mostly Black/ White Mulatto mixes, with no real Native.American allelles. I have two Italian grandparents, one Portuguese grandparent and one Ashkenazi Jewish grandparent. My results have a lot of Italian and Jewish groups both Ashkenazi and Sephardi, but all of my results seem to have either Palestinian, Syrian, Druze, Lebanese or Samaritan...Do you know if this is common among any of the three populations I come from? I know Arabs were in Italy and that Jews are also related to Middle Eastern populations...Just trying to find out why these groups come up so much in my results. It's not unusual for Mediterraneans to get results in the Middle East too. I don't know much about Jewish DNA but Samaritans are Jewish so I assume what you're seeing is at least not unheard of. hi louie,i am also italian and greek and getting lots of jewish popping up.like you i am getting druze,samaritan and palistine.what i dont understand is some of these percentages.i am wondering which side my jewish is on.my sister is also coming up with jewish also. I am Filipino and I found the Dodecad V3 the most useful calculator. Hi. Can you tell me (and a whole lot of others) what "Southern" stands for? We just can't figure it out. Thanks! Which calculator are you using? I do recall coming across that before, and I think I assumed it meant Southern Europe, but I can't be sure because I don't remember the calculator. If that doesn't seem right, I would try contacting the calculator's creator and asking. They seem to be lumping all of Africa into one group, so that rules out Southern Africa. There's already a South Asia group, so it's not Southern Asia. The Atlantic-Baltic group is obviously Northern Europe, so it makes the most sense for this to be Southern Europe. Additionally, when I run this calculator, I get 22% in "Southern" which should only happen if it's meant to be Southern Europe since I am of European descent. This is great if your Ashkenazi but those who are Sephardic who do we use ? If you check out the spreadsheets I made here: https://docs.google.com/spreadsheets/d/e/2PACX-1vQyi9kkGOYOlKIKdoweLNTXNBXpYr_JpcBXUS5L2Yj-f5NE7GSoRJT-yRc-YWKbcK5XpmWH0Iv82Hcf/pubhtml# - click on "Jewish Populations in Oracle", you'll see that Oracle often include many different types of Jewish populations and which calculators to find them under. Many of them include Sephardic, and MDLP World and World-22 offer the most Jewish populations in total. Oracle won't give you a percentage but it will hopefully tell you how closely you match the population. Jita'ame, what calculator were you using when you got 37% East Africa? Certain calculators are primarily for African descent and running European DNA through them will give false African results. I see the last results you listed were from Ethiohelix K10 + French. Although that one is for mixed African and European DNA, even so, ANY Ethiohelix calculator is designed for people who have strong African ancestry - using those calculators is not going to give accurate results for someone who is primarily or entirely non-African. If you were using Ethiohelix for all these results, it is not surprising you have such strong African results, but it is not an accurate calculation for you. Thanks for putting together this fantastic resource. My grandparents were all from China but one was from the extreme north (Inner Mongolia) and one from the far south (near Thailand). My father's side is from a province that had large populations of settlers from the Silk Road. I've gotten all sorts of wild results from the GEDMatch calculators and have no idea which one is accurate. Do you recommend any particular GEDMatch for East Asians? Thank you SO much for this! I've always wondered why there were no explanations for these features on the site. This will be very helpful! Can someone explain primary population source vs secondary population source? Below are my Mixed Mode population source. Primary is just the population more of your DNA matched - you may notice that all the ones listed under Primary Population have the higher percentage than the Secondary Population. RISE seems to be related to ancient (prehistoric) populations - I'm not sure if it means much on it's own, I'd focus more on what the rest of the population name says. For example, in puntDNAL K12 Ancient oracle populations there's one called "BattleAxe Sweden SG RISE94" - looking at the map, the sample called "RISE94, Battle Axe, 2621-2472 BC" is in Sweden so I assume that population comes from this sample. The map shows exactly where this sample was found. Hope it helps! You give an excellent overview. I have been using the various Gedmatch calculators with my 23andme raw data - and for me they are very accurate in matching my known with my ancestry shown on Gedmatch. Also with the ancient dna samples. Cheers! Thank you thank you thank you for this! I was getting so confused and this really made a difference. Excellent article! Something is puzzling me - the mixed mode population sharing. Eurogenes K13 results show my 2 largest DNA groups as North Atlantic and Baltic, both of which must be old DNA as my known family history is Irish/Scottish/English. When Oracle breaks that down to Single Population Sharing, North Dutch is second on that list. But in Mixed Mode Population Sharing the list is headed by 12 entries for North Dutch each of which is paired with a different Indian tribe! Each of those tribes is in the 2% range relative to North Dutch and the distance in all cases is also in the 2 range. Some googling on my part has failed to find evidence of migration from India to Holland that goes back far enough in time to account for such a strange mix. Both Ancestry and GEDMatch give me very small percentages of South Asian DNA so that in itself is not a surprise but this multitude of Indian tribes popping up certainly is! Can you comment, please? Well, if it's only showing up as 2% then it doesn't seem far off the trace amounts in South Asia you get from Ancestry and Gedmatch. North Atlantic is pretty normal for the British Isles, and the North Dutch results are probably related to that. This is where the Spreadsheet option comes in handy - if you look at it for Eurogenes K13, you'll see North Dutch peaks in North Atlantic and Baltic. Thanks for your reply. I'll check out that spreadsheet but my basic problem is that I don't understand the MMPS system, i.e. 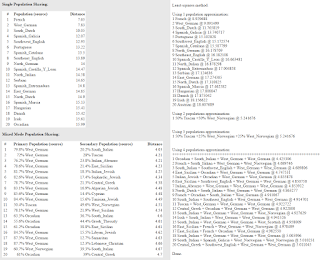 why you can get multiple entries for a single population group (e.g. 12 entries for North Dutch). Each line is a different comparison. If you're getting North Dutch results in 12 out of 20 results, then you most commonly match that population for that calculator. Thank you so much !!! This has been so helpful. (I am in Colorado too... love it here). Thanks again! Thank you SO much!! I was totally lost and now it's all starting to make sense. You're absolutely marvellous!!! History Chick, thank you so much for your fantastic analysis of these complex admixture calculators. This was very helpful to me since I'm half Western European and half East Asian. 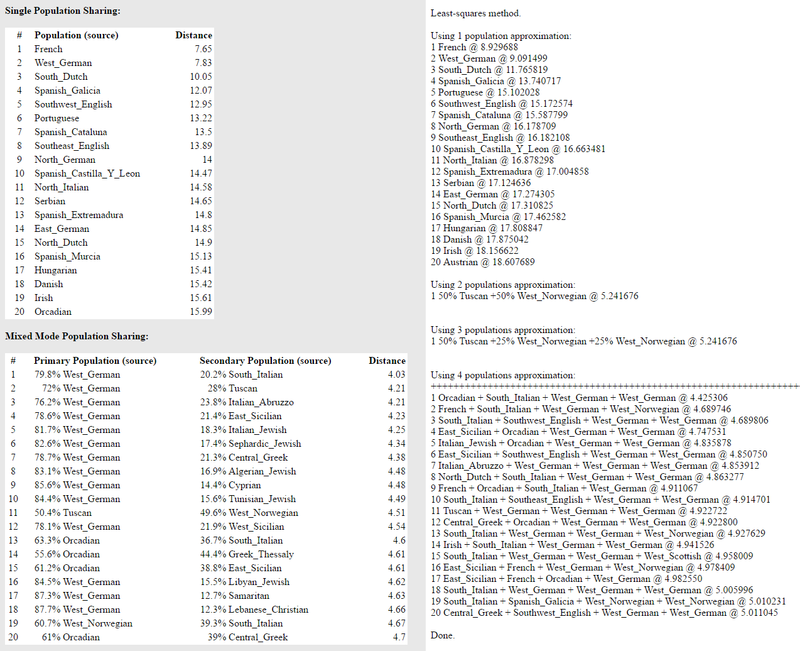 I noticed that the Oracle admixture components for 2 populations are accurate for me in most of the Gedmatch project calculators (I did not use the ones primarily for African and Jewish people). In my case, the 2 admixture Oracle calculations are all 50%-50% for a European and an Asian population, which is correct, and those populations are mostly accurate based on my personal knowledge of my ancestry. descriptions are difficult to find. This has made Gedmatch more meaningful and entertaining for me. Have a great day and year! I truly appreciated your information! I am new to this field, and I am grateful for your help, "clearing the waters"! So if our parents came from more than 1 area...should we ignore single population results? This is such a helpful guide - thank you! Great guide. Apparently I'm almost a lot jewish and I didn't know that! i wanted to leave my thanks as this is fantastic! i knew some (a tiny fraction, ok) of this from study and context but your detail and step-by-step instruction are excellent. you've filled in the (who are we kidding, considerable) gaps in my knowledge and certainly made many things easier for me to explain to family (as well as myself!). Thank you. I understood some of GEDmatch, but this made is much easier. Finally information that I can begin to understand. Long way to go though. Most grateful. Many thanks for breaking this information down for us! Very helpful and much appreciated. All the work you have done is outstanding...just wondering. We are Scottish Highlanders who know we have Viking ancestry. Can you lead us to where we should search for that in Gedmatch. Thank you very much. What is the difference between North Sea and North Atlantic in terms of what Countries are included? The only calculator that includes both North Sea and North Atlantic (versus just Atlantic) is Eurogenes K36, which unfortunately doesn't have a spreadsheet. However, there are unofficial maps available for it here: https://anthrogenica.com/showthread.php?10347-(Unofficial)-oracle-for-Eurogenes-K36-256-reference-populations - they cover much of the same areas, but North Atlantic is more weighted towards Ireland, Scotland, Wales, and England, whereas North Sea is weighted more towards Norway, Sweden, Denmark, and the Netherlands. I was looking for explanations on how to use Gedmatch and found its great exposure. Please, can you clarify to me three specific results that I obtained using the calculators? Thank you very much for your attention. I took the direct test for Myheritage and, like many people, I transferred my raw data to other sites. I noticed that MyHeritage did not specify Amerindian or Amazonian DNA. DNALand was more objective in this case. Myheritage "gave" me 1.7% of West Asia and did not include any specific place, since the DNALand "gave" me 1.4% Arab / Egyptian including Yemenite Jew in Yemen. The FTDNA did not show me any of the above results. What most caught my attention in Gedmatch were Ashkenazim results. As far as I know, my father's grandfather owned a few lands and cattle rancher. On Saturday, neither he nor his employees worked, for the day was "holy." It is well known that in the area where I live, many crypto-Jews settled in, but, taking away my father's grandfather, I have no knowledge of Jewish ancestors in the family. On the maternal side I know little and I am not aware of any Jewish ancestors either. Taking into account the results of Jewish ancestry that I obtained with gedmatch, should I consider myself a Jewess - by DNA pathways - or are these results just a noise and mean absolutely nothing? If the answer is yes, would it be correct to say that I am at least 50% Jewish or can not calculate the percentage for sure? If the answer is no, if you have interest or curiosity, here are the results of the other three calculators that I used. The PuntDNAL K15 was the most "accurate". I logged in just to thank the author. Excellent job! Ok, so I think I am understanding everything correctly. I am not 100% sure where my maternal grandmother is from as she was adopted and she does not know her background. Throughout all the tests, I ran MDLP World-22 and that is closest numbers I have found. However, I am not sure if that is the most accurate? Regardless, I am posting my results below. Any help would be greatly appreciated. This blog is amazing and has been very helpful. Thank you!! Which DNA Company is the "Best" for Ethnicity? I'm a 30-something year old photographer and homesick Pennsylvanian who spent eight years in Manchester, England before moving to Colorado with her British husband. I love all things history and genealogy, if I'm not researching my genealogy in my spare time, I'm usually reading a historical novel or history book. So it's no surprise I run two blogs, one for history-related book reviews and this one on genealogy. My known European heritage is mainly German (and Swiss), Italian, British (English and Scots-Irish), and Norwegian, with a little bit of Dutch and French Huguenot from way back on one branch. I've been researching my tree for about 8 years and my US research is based mostly in Pennsylvania (mainly Philadelphia and Pittsburgh areas), but also some in Wisconsin, Kentucky, Virginia, New York, New Jersey, and Ohio. 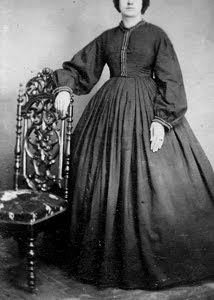 If you're wondering, my avatar is one of my ancestors from my photographic heirloom collection. I cropped off her head simply because I don't like having pictures of other people's faces as my avatar.